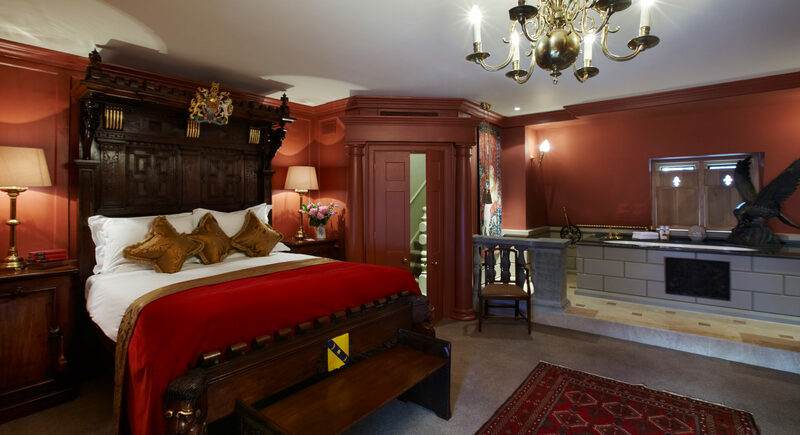 The Duke of Monmouth would have felt very much at home in this spectacular two storey suite. The renegade Duke, Soho Square’s most notorious resident, was beheaded in 1685 for leading a rebellion against the King, his uncle. His suite incorporates a grand and spacious bedroom, an intimate sitting room with a working fireplace, and a garden with a sliding glass roof which allows you to enjoy it even on a typical London summer’s day! The sitting room and garden are accessible without passing through the bedroom – ideal for entertaining friends or business associates during your stay. You’ll find it hard to resist sharing the vast marble bath, filled with water from the beak of a life-sized eagle. The room is air-conditioned and has complimentary Wi-Fi, flat screen television, mini bar, safe, ornate antique desk and REN toiletries.